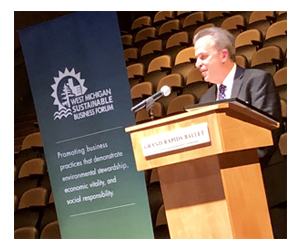 Executive Vice President of the Americas at Natural Capital Partners, Mark LaCroix, has been inducted into the West Michigan Sustainable Business Forum (WMSBF) Hall of Fame. This honor is given in recognition of his achievements in progressing positive environmental action by businesses throughout North America. Finalists for this lifetime achievement award are selected by a nominating committee comprised of past inductees and past WMSBF board presidents. This year they chose Mark, to recognize the great contribution he has made to sustainable business throughout his career so far. From his early induction into business action on climate at international carpet manufacturer Interface, to the last 10 years leading Natural Capital Partners’ work in the Americas, Mark has shown what experience combined with a continual desire to learn more can achieve. Through Mark’s work with our clients he has reduced more than 4.7 million tonnes of greenhouse gas emissions and has driven demand for more than 6 million MWh of renewable energy. To discuss how your business can achieve its climate and renewable energy goals, please contact Mark at mlacroix@naturalcapitalpartners.com. Watch Mark explain how companies can meet their renewable energy goals.